Will your class solve this math mission in time? 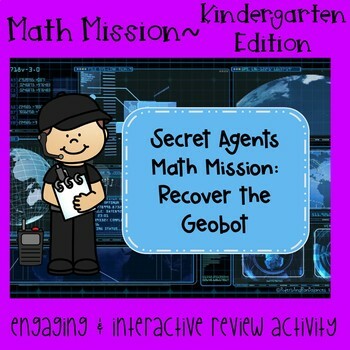 This fun and engaging game involves your students in a timed, interactive game where they become Secret Agents on a mission to find the Geobot - a very important robot. Students will solve a series of questions and clues in order to compete the tasks required to solve the mystery. 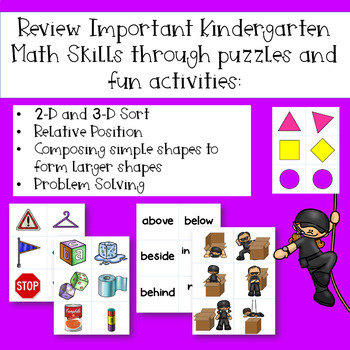 Review important Kindergarten geometry math skills involving 2-D and 3-D shapes. Students will sort 2-D and 3-D shapes, describe objects in the environment using names of shapes, and describe the relative positions of these objects using terms such as above, below, beside, in front of, behind, and next to, compose simple shapes to make larger shapes. 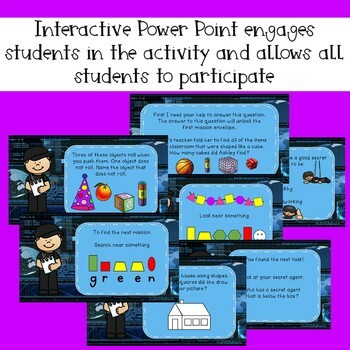 This interactive mission is great for a review at the end of a unit or to maintain skills throughout the year. It would even work at the beginning of 1st grade review of those Kindergarten skills. Similar to a scavenger hunt, students will have 4 opportunities to move around the room and look for the mission envelopes. These envelopes will contain the materials they need to complete the next task - 2-D and 3-D shapes, secret agents above, below, beside, in front of, behind, and next to a rectangular prism (a box), shapes to name and place in a pattern, and triangles used to compose larger shapes. Everything is included except for the 4 envelopes the teacher will need to provide. 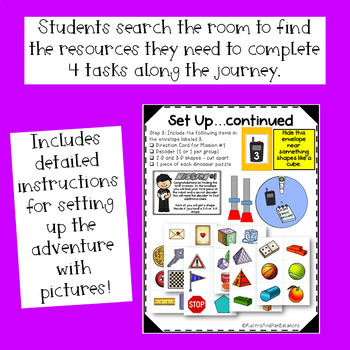 This Math Mission is also available in a 1st or 2nd Grade version. Looking for more hundred board activities? Try Hidden Pictures. The animal pictures hide behind the numbers on your hundreds pocket chart.